Looking for easy vegetarian recipes that will feed a hungry crowd? You have to try this delicious eggplant lasagna recipe! 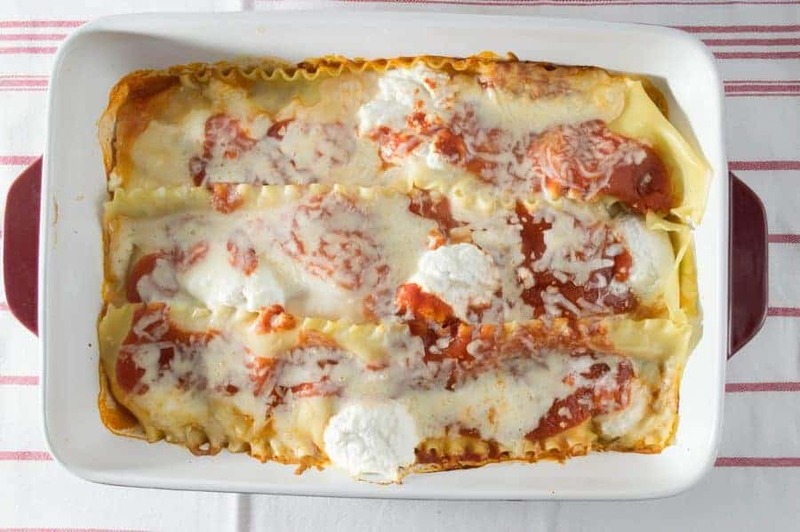 Whether you’re hosting a massive Super Bowl party, throwing a victory dinner for your teen’s swim team, or just trying to find a great meatless Monday recipe for your own home team after a day on the ski slopes, this yummy Italian recipe is so fully of cheesy goodness, everyone will ask for seconds! It’s super easy to make and done in under 30 minutes! Let’s check it out, then you can print the printable recipe card for later! Affiliate links included below. Thanks for your support. You will also need a rectangular baking dish . 1. Preheat oven to 425 degrees. Boil lasagne sheets according to box’s directions. Once boiled, remove from heat. 2. Cover your pan with a thin layer of tomato sauce. Put 3 lasagna sheets (enough to cover the pan) and then layer on eggplants. Sprinkle with mozzarella and ricotta cheese. Pour more tomato sauce. Continue the layers until you reach the last 3 lasagna sheets. 3. The top layer should be 3 lasagna sheets, mozzarella, and the remaining ricotta cheese. Pour remaining tomato sauce on top. 4. Cover with aluminum foil and bake for about 25 minutes. You will also need a rectangular baking dish. Preheat oven to 425 degrees. Boil lasagne sheets according to box's directions. Once boiled, remove from heat. Cover your pan with a thin layer of tomato sauce. Put 3 lasagna sheets (enough to cover the pan) and then layer on eggplants. Sprinkle with mozzarella and ricotta cheese. Pour more tomato sauce. Continue the layers until you reach the last 3 lasagna sheets. The top layer should be 3 lasagna sheets, mozzarella, and the remaining ricotta cheese. Pour remaining tomato sauce on top. Cover with aluminum foil and bake for about 25 minutes. That’s it! Yum, right? 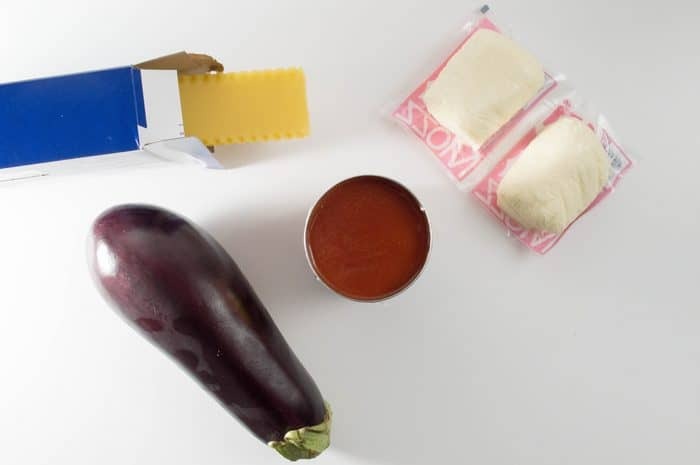 The eggplant gives the lasagna a bit more substance (especially for those who are used to eating it with meat filling) and adds a healthier kick to it. Eggplant is rich in antioxidants as well as fiber. You can either eat it with the skin or remove the skin before slicing it up. Totally up to you! If you find eggplant to be a bit bitter or want to make it a little softer, you can also throw some salt on it (okay, sprinkle, not literally throw), then set it aside for about half an hour. Rinse the salt off before using it to maintain a heart-healthy diet. 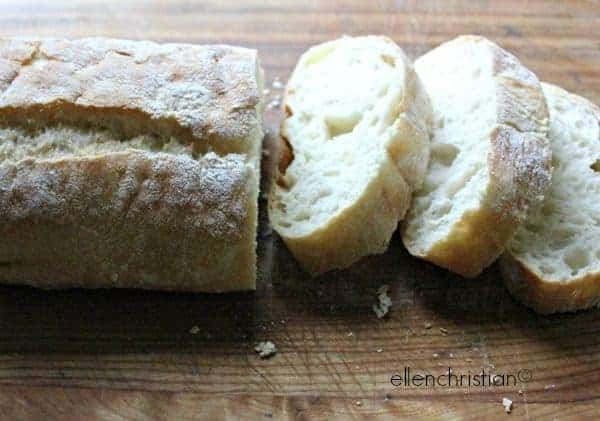 This recipe pairs perfectly with our homemade garlic bread. Serve it with a delicious salad to start the meal. Have you ever made eggplant lasagna? Do you have any favorite easy vegetarian recipes? Share in the comments! Will Breastfeeding Cause Your Breasts to Sag? Stop Fighting & Misbehaving with Consequences that Actually Work! Drink Your Veggies with These Yummy Juice Recipes! Lover of French fries, pizza, and all things sweet (double points for brownies and chocolate chip cookies), Lisa Favre has a knack for developing dessert recipes and is always on the lookout for the next best thing in sweet treats. Lisa is most inspired by her mom's cooking and is always in awe with the dishes her mother elegantly creates on a daily basis. Wife, daughter, sister, and aunt, Lisa is fully committed to those that she loves most and will never hesitate to bring a batch of cupcakes to the office. I love eggplant Lasagna and Your version looks so easy! It looks so delicious too. My family will love this. I definitely need one such easy vegetarian recipe as I am having a party at home this weekend for my family. 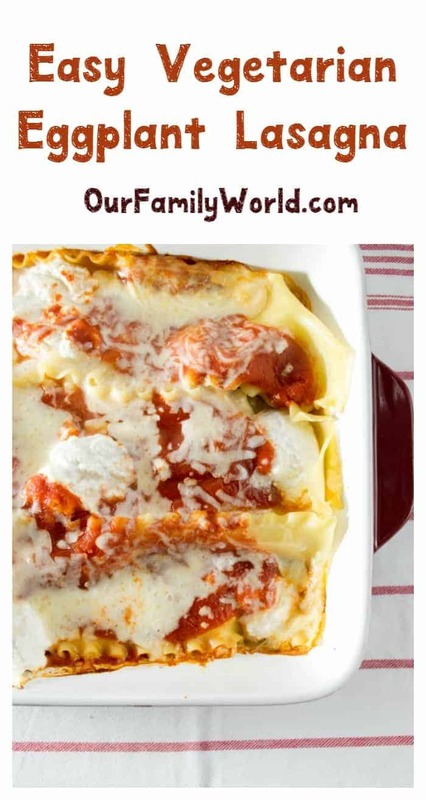 The lasagna looks absolutely delicious & mouth watering and I love that you get it done in such a short time! Oh my gosh this looks and sounds so delicious. I love eggplant and lasagna. I’m trying to figure out if I could freeze half of this when I make it because I live alone and that seems way more than I could eat in one or two meals. I think judging from the ingredients, that freezing is doable. I haven’t tried egg plant lasagna before to be honest. This looks so good. I heard cabbage is a good alternative – similar to cabbage rolls. Vegetarian lasagna is my favorite. I either use spinach, eggplant, zucchini, or a mix. The flavors are delicious. It tastes even better the next day. Eggplant is one of my favorite things to cook with! I have never made a lasagna before but this looks delicious. I’m not a big fan of Eggplant, but do know a few people who do. The salt tip is very useful. We do this with our cabbage. Oh this is great. I’d love to make this for myself! I could use a warm, comforting pasta dish right now. Absolutely scrumptious! I definitely wouldn’t mind having this for dinner tonight. This lasagna looks really delicious and it seems quite easy to make. I’ve never made a lasagna with eggplant before, but I’m looking for more meatless options so I am definitely printing this one! Oh yum! I will have to send this to my sis, she would love it!